Farmers at last year's event. Plant health officials, agronomists, scientists, machinery companies, trade and marketing organisations will have stands and the latest science, technology and practical advice will be on offer for growers, seed breeders and exporters. The packed one-day programme on Thursday August 10 takes the form of a full day of agronomy and variety demonstration plots with guided tours, a technical seminar programme, research and trade stands together with static and working machinery displays. The seminar programme will focus on four key subjects: market intelligence, apps and diagnostic tools, late blight and agronomy. AHDB head of strategic insight David Swales will outline the challenges and opportunities for the potato industry from Brexit and give a consumer trends update. Speaking ahead of the event, Mr Swales said: “Changes to trade regulations could present both challenges and opportunities for British potato growers. There is uncertainty over what trade agreements may be in place in our traditional seed markets, which are predominantly outside the EU, as we currently operate through EU trade agreements with these countries. The diagnostic tools session will see demonstrations of new tools PotatoSize, Buntata and BlightWatch, and on-site demonstration topics will include the past, present and future of the fight against blight. The blight session includes a presentation on the Hutton Criteria for blight risk analysis, and the agronomy session will feature talks on the rise of potato cyst nematodes (PCN) in ware potatoes and Scotland’s green cover trials. AHDB director Rob Clayton said: “The market we are operating in is changing rapidly and PiP gives us a chance to work together as an industry to gear-up for the challenges and opportunities ahead. “Attention to detail in order to produce a competitive offering is the best way for British growers to take advantage of new prospects. 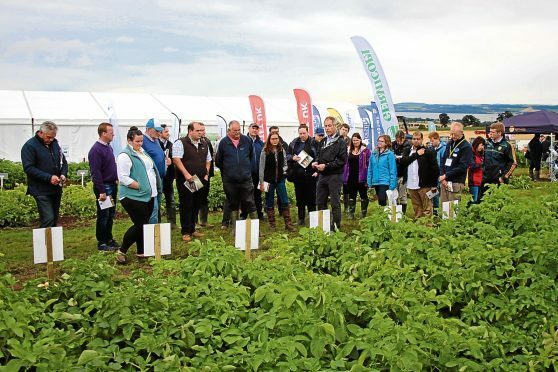 PiP is organised in partnership with AHDB Potatoes, SRUC and Agrii.